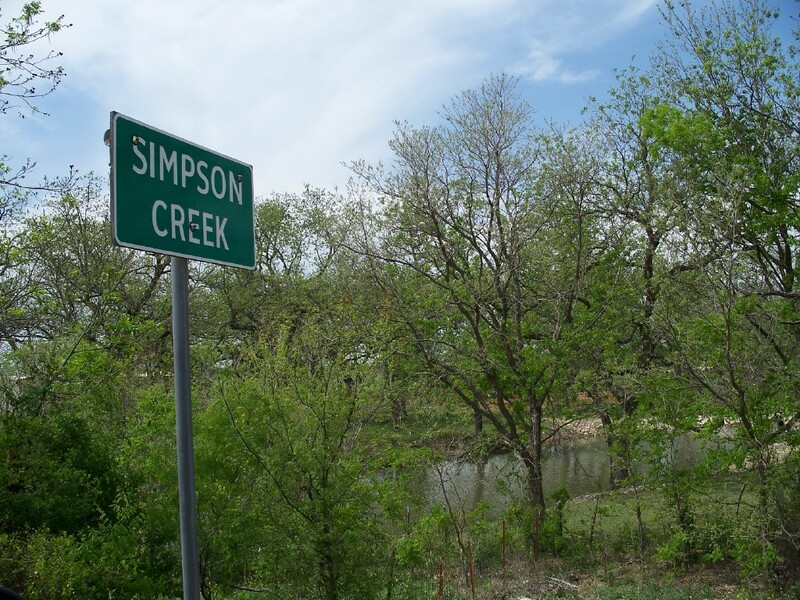 I designed the fictional town of Simpson Creek with a main street running east and west, with the eastern edge of the town and the church right on the eastern edge of the creek. 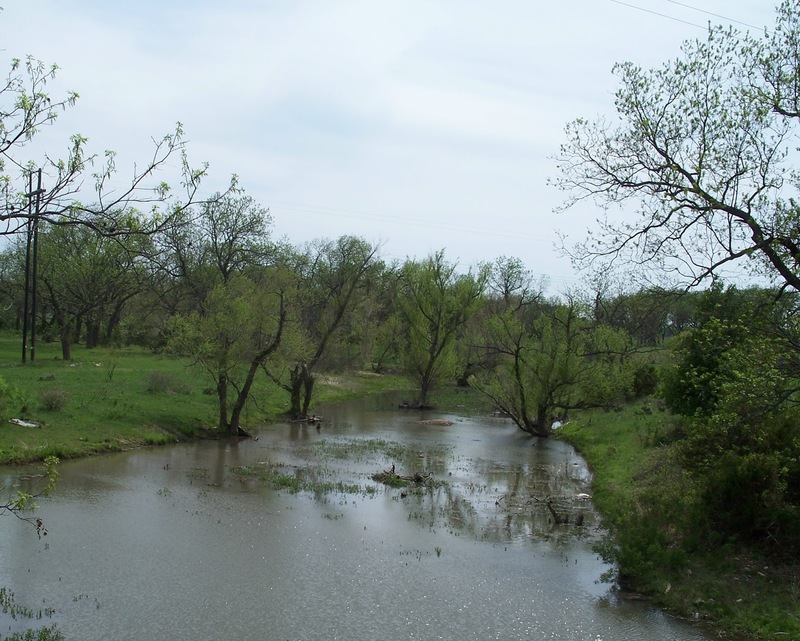 As I wrote the first few books in the series, this creek would be the site of a Commanche attack, a place for the couples in the books to fish, walk and get to know one another. A lumber mill would be situated along the mill, and nearby, the school. San Saba Texas, which is just west of my fictional town, is situated on the Edwards Plateau in central Texas. The San Saba River runs through it. 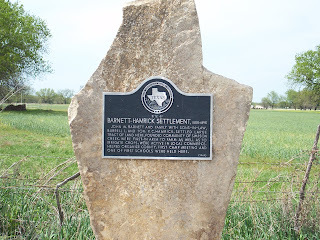 Before the town was organized, the area was frequented by Comanche, Apache, Tonkawa, Wacos, Kickapoo and Caddo Indians, and was the site of a Spanish mission, Santa Cruz de San Saba. In 1847, a treaty between the German Texans and the Comanches was signed. In 1856, the county was organized from Bexar County and named for the river and the town of the same name selected as the county seat. There were about 1425 people in the county in 1870. 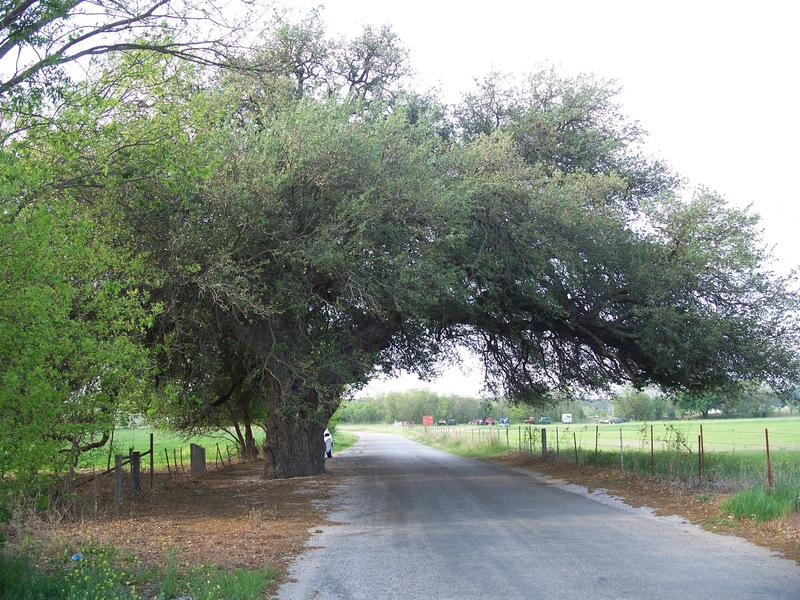 San Saba bills itself as the "Pecan Capital of the World" due to the work of Edmund Riesen in improving local nuts, especially the pecan, but the trees were native to the area and were a cash crop as early as 1857. 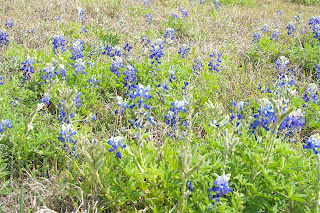 Of course, the best time to visit central Texas is in the spring, particularly mid-March to mid-April, when the bluebonnets, the state flower of Texas, are at their peak. They were actually a little past their prime when we visited for this research trip, but I think you can get the idea of how glorious a whole field of them could be. I'd like to mention the book I'm giving away as a prize to one lucky commenter to this blog entry, my May Love Inspired Historical, HILL COUNTRY CATTLEMAN. This is the story of Raleigh Masterson, a cowboy and former cattle drive trailboss, and his unlikely romance with Violet Brookfield, sister of an earl. Violet comes to Texas to write a western while waiting for scandal to die down in England, never guessing that she'll remain in Texas with Raleigh. Remember, the more comments you make on Christian Fiction Historical Society this month, the more chances you have to win a KINDLE at the end of the month! How neat! 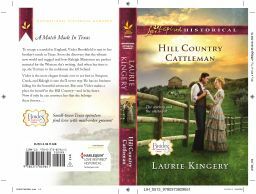 I like seeing how authors build their settings --and "Hill Country Cattleman" sounds like it has an unusual cast of characters. Thanks for the chance to win! Certainly my favorite state too, Anonymous! I think of Heaven as my ultimate home, and Texas as my soul's earthly home, even though I live in the north. So cool to learn some more about the setting of the Brides of Simpson Creek! I love this series so much and I can't wait to read Hill Country Cattleman!!! It sounds so amazingly awesome it's very near the top of my to-get list! Thank you so much for the chance to win a copy! Abby Hart, thanks for letting me know you're enjoying the series! Good luck! I can imagine the thrill you had as you discovered that marker for "your" town. Thanks for the chance to win one of your books. This contest has been so much fun! Connie, thanks for posting. Good luck with the contest! 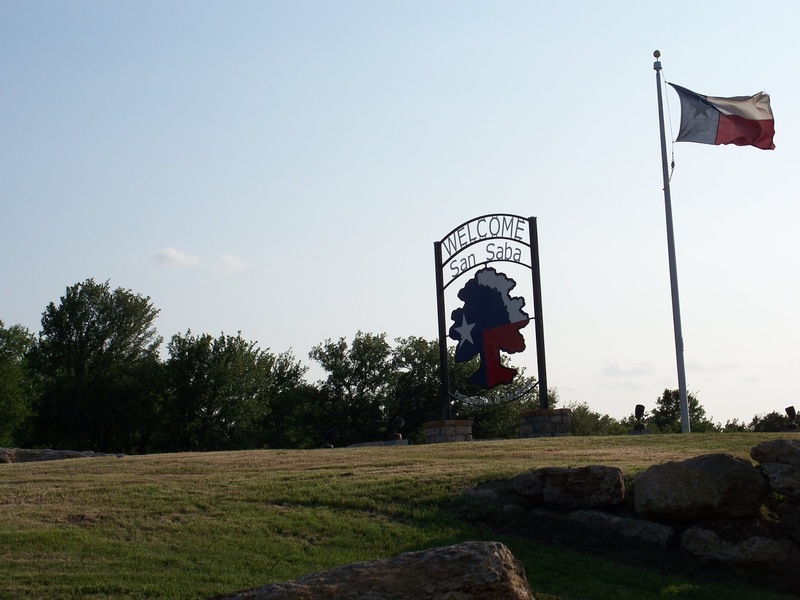 How cool and exciting to find out that a town that you created was actually a town the really existed and you did not know it. I am sure you were very excited to find this out. Thank you for the giveaway. I like your name for your book better, too! "The Wedding Tree" has such a nice ring to it! :) And the real Wedding Tree was very cool. The Hill Country is my favorite part of the state. When we go to Fredericksburg and Kerrville, I want to live there, but then we have to come back home to the flatlands of the coast. The bluebonnets aren't as pretty this year, but oh when they are and you look out at that sea of blue,your heart swells with love for a God who gives us such beauty. Great post about our state. Thanks, Laurie. Hi Martha, at least you live in Texas, right? I'm plotting a return to live there someday. 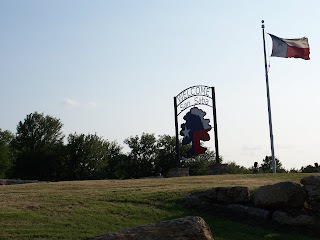 ;) Fredericksburg is one of my favorite places, and I've often thought living in Kerrville would suit me fine--any place in the Hill Country! Thanks for posting. I'm glad you visited and did your research. As native Texan, I get upset when a section of our state is described and I know it's not like that at all. We do have a great variety from the Big Bend and its mountains to Palo Duro Canyon to the great pine forests to the Gulf Coast, from the big cities to the small country towns, Texas is as diverse as our nation. I look forward to reading your book. I have some wonderful pictures from near Kerrville that are beautiful. Linda, some days it *does* come flowing out, but usually, yeah, one has to work at it. Maybe for hours, and then the flow begins, hopefully. There's nothing like a deadline to make that happen. Nice "meeting" you too. Eliza, thanks! I'm learning a lot at this blog, too! I love it when it seems like the Lord has led your creativity and backs it up with historical fact. Beautiful place, and lovely post! Thanks, Kathleen! It's nice to get to know you better here. Sounds like a fun book, I'm sure a proper English Lady never imagined staying in Texas! Interesting and informative post. I love visiting the Hill Country. I'm a transplanted Texan who has now lived here longer than in Indiana, where I was born, or in New Mexico, where I grew up. I'd love to win the book. The Kindle would be great because thn my husband could still play Angry Birds while I read. My dad was a Hoosier too! He met my mom while she was in nursing school. I'm envious that you live in Texas now...Good luck with the contest--I can't get very far on Angry Birds at all. :/ No patience or finesses, I guess. Great post and pretty photos. I truly enjoy this new blog! Thanks, Chaplain Debbie! I'm enjoying reading my fellow blogmates' posts, too, and it's nice to get a chance to use my Texas photos. I loved reading about The Wedding Tree and the picture was pretty. Thanks for having the giveaway. Hi Rose, you're very welcome! Come back often! Rose, you are my winner! I'll email you separately to get your address. Sue, I love Texas history too! It's worth the trip. San Saba is a nice little town. I lived in central Texas a few years ago. We enjoyed driving to various places in the Texas hill country. I especially loved the bluebonnets and other wildflowers, so it was nice to see the photos you included. Thanks for a chance to win in the giveaways. Pam, thanks for posting. Always nice to "meet" those who appreciate the Hill Country and its wildflowers. WOW! I live in Texas, and love these books that take place in our huge wonderful state. Loved the San Saba story, and would love to win your give-away of "High Country Cattleman". I was also married to a cattleman. Please put my name in the hat! Thanks Laurie. Maxie, it's like a whole 'nother country! :) thanks for commenting. Enjoyed the snippet of Texas history :) I have visited Texas once and driven through the state at a different time, but have not explored any areas. Your books sound wonderful. I love books set in an area I can learn more about. Thanks. Betz, you've got to go, and start with the Hill Country in April. Unforgettable! Thanks for commenting. How exciting to create your fictional town only to find that a town of that name actually existed. It was obviously meant to be. I would love to be entered to win your new book. I love the Love Inspired Historical line of books! Cindy, I'm glad you're liking LIH! I'm blessed to be a part of them. Thanks for commenting. Enjoyed reading about the site for the setting of your book - I think books based on real places make the reading more enjoyable also. 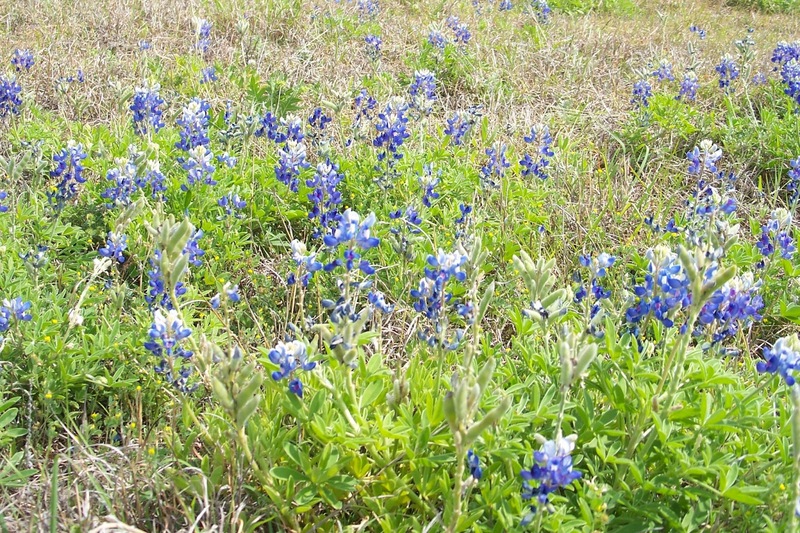 I've heard about those beautiful fields of bluebonnets from a native Texan - would love to see them! Thanks for the opportunity to win your book! Bonnie, I hope you do get to see them. The peak of "bluebonnet season" is mid-March to mid-April, and the more winter rain they get, the more plentiful they are. Then in May the gold flowers come out. It's just like Heaven! Sherrinda, thanks for commenting! It's neat that you've been there. My childhood memories are made up of visits to San Angelo and the neighboring small town of Christoval out in West Texas. So your dad is a preacher? Great that he could preach on short notice like that. Bookishqueen, I like yer monicker, as the old cowboys would say. I'm envious of your friend, but hope to move back there one day too. Thanks for commenting. i wish that the history classes in schools took advantage of fiction authors to tell the stories. You make even the facts sound interesting, and since history is just someone(s) thoughts on things that happened, your novels would be great. Thanks for the chance to win! Marianne, thanks for your comment. History didn't come alive for me until I started reading historical fiction. It's so much more interesting when it's about people, not just dates. I enjoyed the photo tour, especially the bit about the Wedding Tree. Lovely! Thanks for the insight into central TX and for the giveaway opportunity! Georgetown has a wonderful breakfast place!! Yum, Yum. You can order what you want without a menu. I love the Texas bluebonnets and the red arrow flowers. We are hoping to add grasses and wildflowers so we don't need to mow our side fields here in the Missouri Ozarks. How excited you must have been to find the historical plaque after you had already named your town!! This sounds like a great book, nice cover too. I've loved every book in the Simpson Creek series, please add me to the drawing. Thanks! Thanks for some history of Texas. 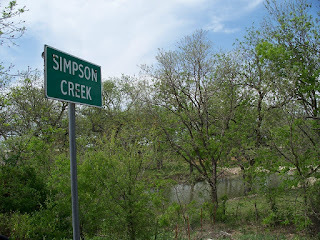 It would definitely be interesting to learn more about the real Simpson Creek and its former inhabitants. Thanks for the giveaway.